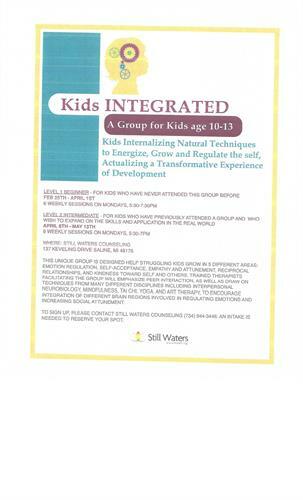 Still Waters Counseling is offering the next step for kids who have completed on of the beginning sessons for Kids INTEGRATED. This group allows the kids to expand on the skills learned in beginning session of Kids INTEGRATED and allows them to apply skills to real world situations. The group is open to kids 10-13 who have attended beginner session or have attended a similar workshop/group. Mondays 5:30-7:30p for six weeks starting April 8th.